I’ve been drooling over the journals and other leather goods at Renaissance Art for quite some time now. But these days I usually only get to do a few pages in a new journal or sketchbook and then I’m off to work in another. Given the price for these quality items, it didn’t seem a good fit for me at the moment. The Refillable Passport Pocket Sized One Book is a fantastic way to check out the quality and enjoy one of these fine books without spending much money. They are free! However, there is a $12.97 shipping & handling charge. They can be sent to U.S. customers only, and they are for new customers only. One per person. They come in two versions–the single version has a beaded string bookmark (African Trade Beads are used) and the double version has a loop with no beads or bookmarks. I opted for the single version because I liked the beads. I decided to review this journal a little differently. 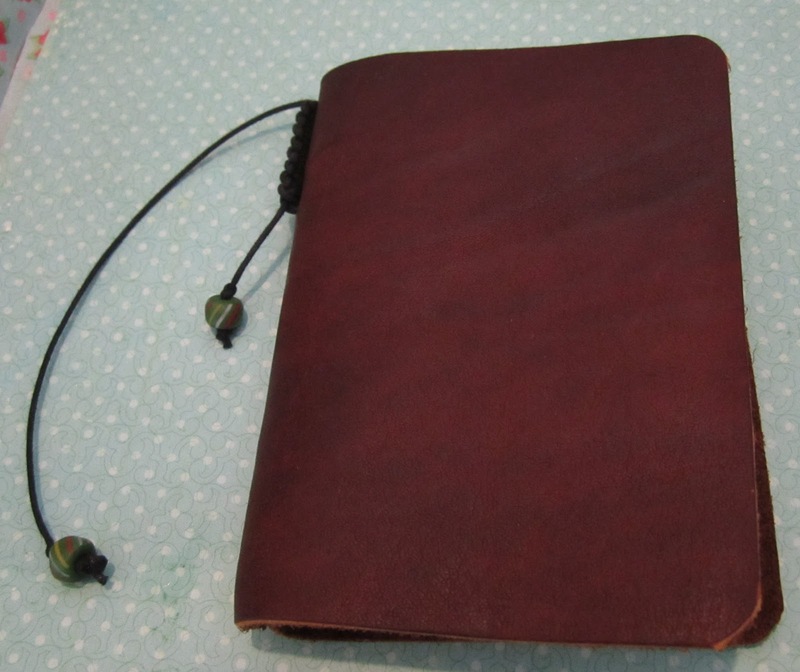 Since this is a ‘refillable’ journal, you might not always use the refills that it comes with, so I felt the cover should be reviewed in more detail than I normally would. I didn’t try out as many mediums as I usually do, partly because of time, and partly because I need to get some new art supplies and am waiting on next month’s budget, lol! 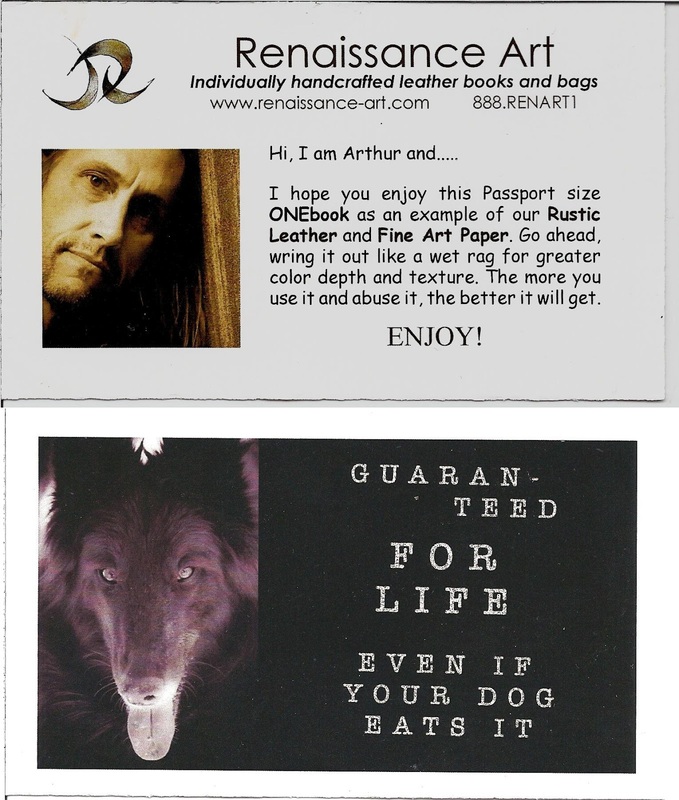 In fact, the journal comes with a card inviting you to ‘abuse’ the journal, and promising the lifetime guarantee. 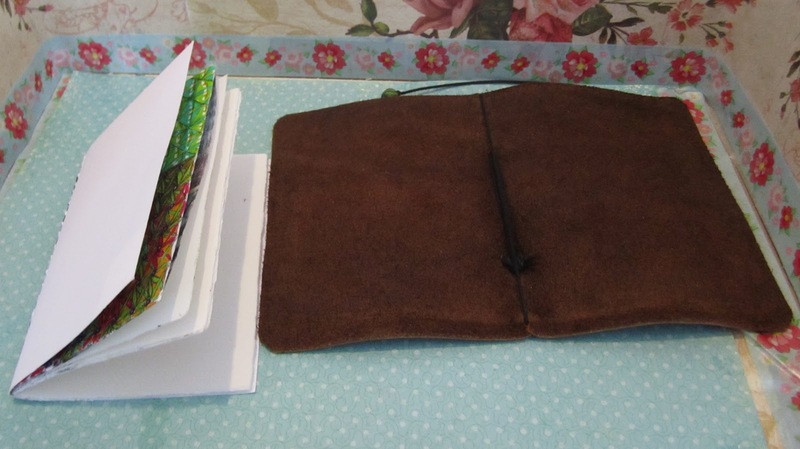 The leather cover is extremely flexible, a thick piece of quality leather in a lovely, rich brown. I decided to try out the stress test. First, I removed the paper. 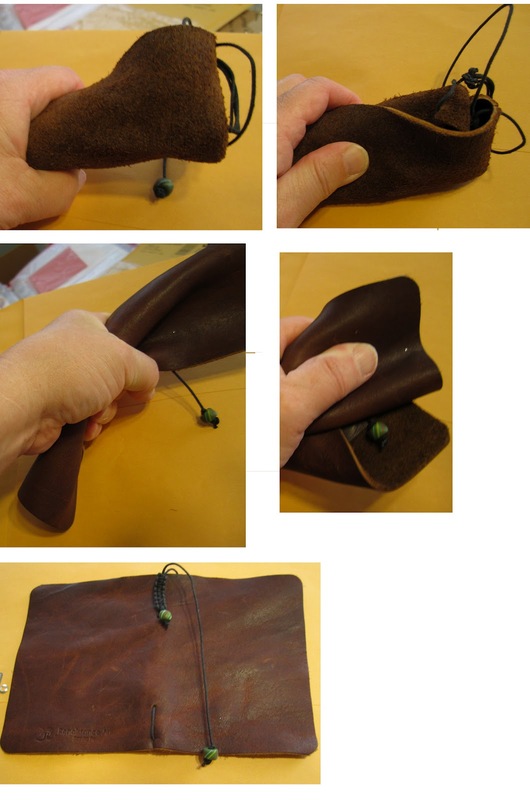 And then I twisted and scrunched and squeezed the leather cover. As the card indicated, the leather held up, merely taking on some distress marks. It flattened back out with no problem, no worse for wear. A while back, after I accidentally dropped a notebook into a bowl of oatmeal, I had a conversation with Arthur, the founder of Renaissance Arts, and he told me that one of his journals could simply be loaded up into a dishwasher if that happened, as long as any ink in the book was waterproof. I was tempted to try it, but my dishwasher has died. It’s an experiment for the future though! I put the paper back in, and folded the journal in half, length-wise, back and forth a couple of times. The paper picked up a few dents, but by and large, it was undamaged. 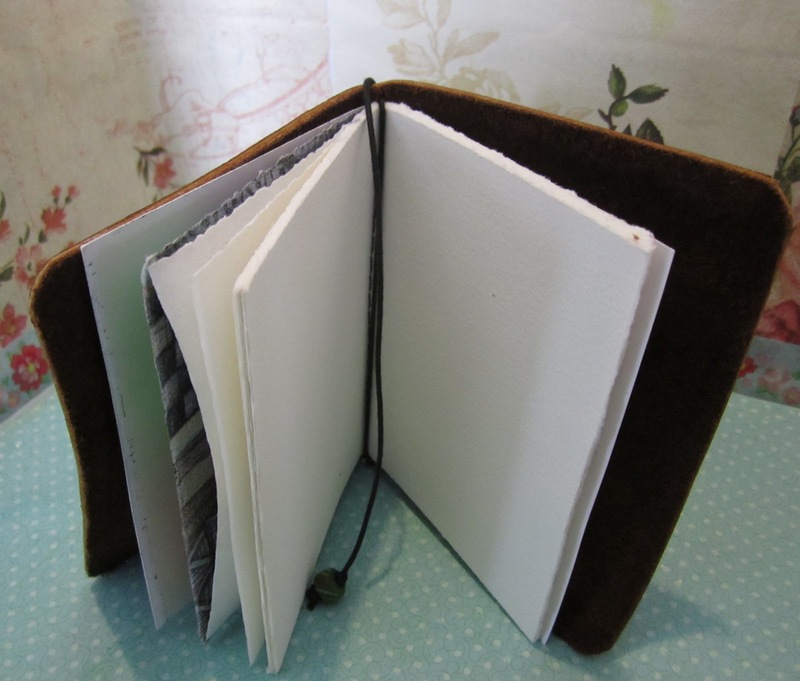 If you want a journal you can fold up and fit in your pocket, this one will work. You won’t want to do this if you want to keep your paper pristine however. The Arches Text Wove paper is 120 GSM, 100% cotton rag a ‘wove’ pattern, some tooth and it’s moderately sized. That means you can use it for almost any medium, including fountain pen or watercolor. The refill is nicely stitched with evenly hand-torn edges. If you buy a 3 pack of refills they come in a cool storage pouch. I only did three examples of artwork. The paper has more tooth than I like for my alcohol markers, which can fray on rougher paper, so I decided to use my Staedtler Triplus Fineliners. The color came out brilliant, but it was a little difficult to get a sharp line. This example has been shown before in my review of Bonnie Jean Woolger’s handmade pen. 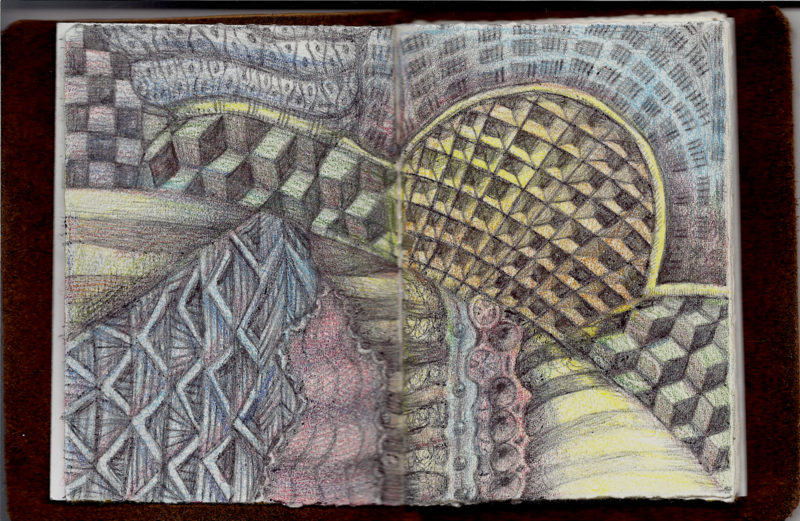 I used Lyra Rembrandt color pencils, and one of Bonnie’s pens, which use Bic ballpoints. This was a more successful medium for paper of this texture and tooth. For the last example I used Peerless Film Watercolors. These are watercolors that don’t need a lot of ‘wet’, and there was no dimpling, no warping and absolutely no bleed-through. This paper could have handled much wetter washes with no problem. 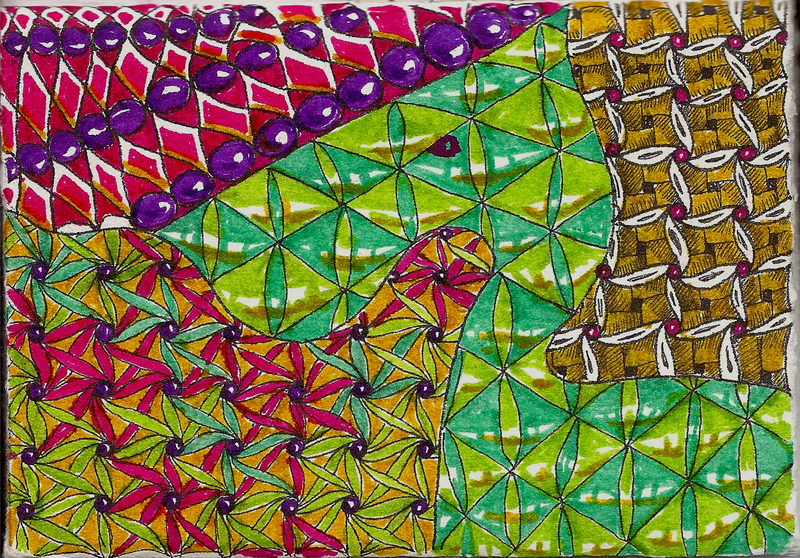 I used a Faber-Castell Medium point Art pen for the tangling. I was able to get both sharp, crisp lines and finer feathery lines by varying the pressure and speed of my drawing. The single journal will take two refills, and I will be buying more (I want one of those storage pouches!) Meanwhile, though, I took a cheapie journal I picked up at a discount store just to see if it would work, and it does. Kind of a travesty, but any paper in a pinch! For a better look at these journals, visit the product page and scroll down to the video. demonstrates the differences between the two styles of Passport Journal and how they can easily be refilled. 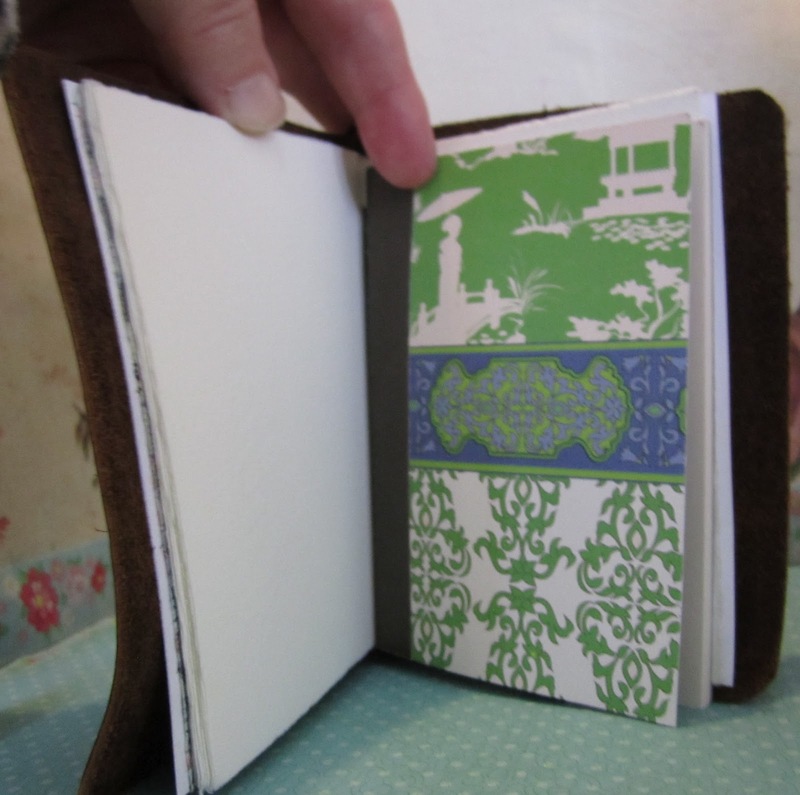 There are several other videos as well, showing how sturdy the journals are. They’re fun to watch as Arthur and co-workers bash and trash and throw their journals around, proving they’ll stand up to almost anything. Next Post: ZIA Journal Prompt 17 "Life’s Ups and Downs"
Ooooh great review!! And of course, your tangles, as usual, are beautiful! I had no idea about these journals but $13 is not bad at all. And I'm sure it draws in a lot of people!! Will you post an update as to how the leather changes with use? I will. I know I'll be using this for artwork, so it will be showing up on my blog a lot. Couldn't resist ordering one. I already have some of the Arches Text Wove paper so I'll be able to make my own refills. The paper is fantastic. So anxious for it to arrive. 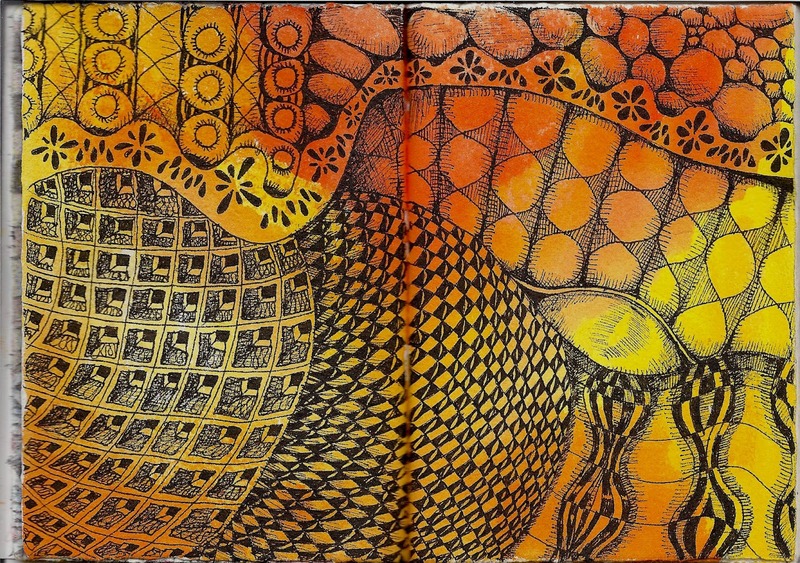 These are very nice journal covers–you'll be using yours for a long time to come! http://www.freeleatherjournal.com/ I did write this review in 2012, so I don't know if the S&H price is still the same.